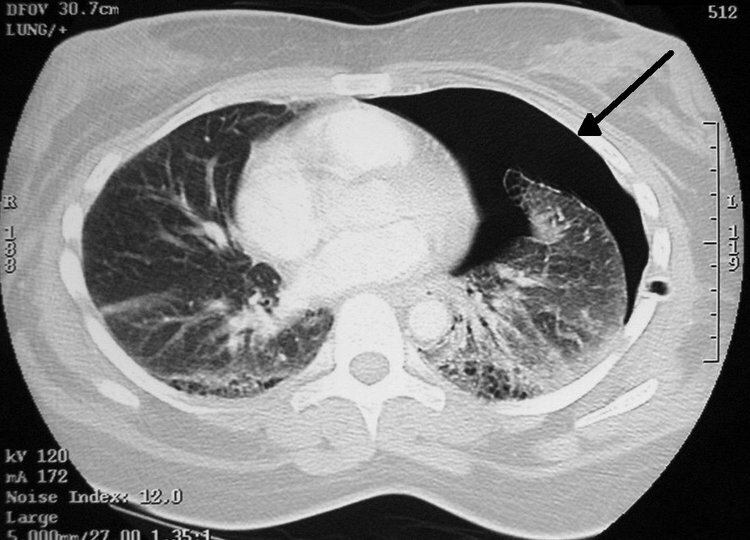 Large pneumothorax on CT with L sided chest tube in place. The Chest Tube Thoracostomy procedure is performed in the chest region. Why is the Chest Tube Thoracostomy radiology procedure Performed? The following equipment is used for a Chest Tube Thoracostomy procedure: A chest tube, CT scan, ultrasound scan, or fluoroscopy with X-ray. There have been no recent advances to replace the Chest Tube Thoracostomy procedure. What is the Cost of performing the Procedure? The cost of the Chest Tube Thoracostomy procedure depends on a variety of factors, such as the type of your health insurance, annual deductibles, co-pay requirements, out-of-network and in-network of your healthcare providers and healthcare facilities. How does the Chest Tube Thoracostomy radiology procedure work? The Chest Tube Thoracostomy procedure may be performed either using an ultrasound scan or a CT scan, depending on individual circumstances. The transducer sends out high-frequency sound waves in the body. When sound waves echo back from the body, the microphone in the transducer records the changes in the sound. How is the Chest Tube Thoracostomy radiology procedure Performed? A Chest Tube Thoracostomy is performed as an outpatient procedure, at a hospital. The interventional radiologist usually performs the Chest Tube Thoracostomy procedure. A Chest Tube Thoracostomy procedure usually takes about 30 minutes to perform. A physician will request your consent for a Chest Tube Thoracostomy procedure using an Informed Consent Form. What are the Limitations of the Chest Tube Thoracostomy radiology Procedure? What is the Chest Tube Thoracostomy procedure? What is to be expected during the Chest Tube Thoracostomy radiology procedure? A local anesthetic is usually given during the Chest Tube Thoracostomy procedure. What are the possible Risks and Complications during the Chest Tube Thoracostomy radiology procedure? What Post-Operative Care is needed at the Healthcare Facility after the Chest Tube Thoracostomy radiology procedure? What is to be expected after the Chest Tube Thoracostomy radiology procedure? What Post-Operative Care is needed at Home after the Chest Tube Thoracostomy radiology procedure? If the patient returns home with the chest tube in place, the patient will be given instructions on how to care for the chest tube and drainage system. If the patient returns home with a tunneled pleural drainage catheter, the patient or care nurse will be instructed on how to care for the tube and the drainage system. After the chest tube is removed, normally the patient should fully recover from the procedure within a few days. A small scar may persist though. The drained fluid will be discarded after the Chest Tube Thoracostomy. However, in some instances, the drained fluid is sent to the pathologist for further analysis. Who will you receive a Bill from, after the Chest Tube Thoracostomy radiology procedure? The patient is advised to inquire and confirm the type of billing, before the Chest Tube Thoracostomy procedure is performed.